These are fun to make but a little more challenging than they look. There is a considerable amount of hand carving and sanding involved. If you have a spindle sander and a belt sander you can cut down on the carving quite a bit. Cut these patterns from 3/4" wood. For the spoons I usually start with the bowl. Sometimes I use a Dremel tool to remove the wood other times I use a carving gouge. After you get the depth of the bowl where you want it you can start contouring the rest of the spoon. Take you time and get a pleasing contour. Remember you can always take off more wood but you can't put it back on. Stop and look at your progress from time to time. Choice of wood and finishing instruction are included with the pattern. 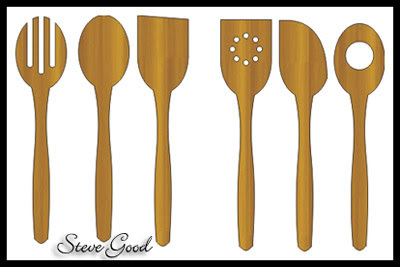 These utensil patterns are about 10" long bu can easily be resized to what ever you like. I get a few emails each month asking about scroll saw blade storage. I have seen dozens of storage containers used. The two pictures in this post are the methods I use. The top picture shows the tubes that I purchased from Sloans Workshop. 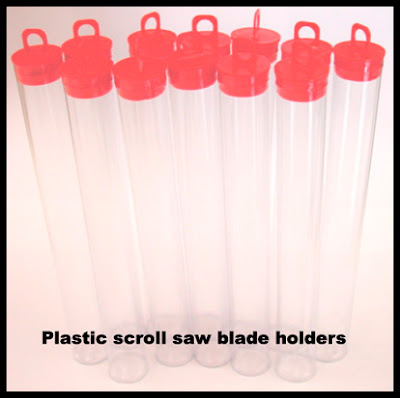 These are just the right size and you can quickly see how many blades you have left. I print labels for each blade type & size and stick them on the tube. The bottom picture shows a method that works great also. These are 1/2" pvc pipe cut to 6". You can also purchase the end caps. 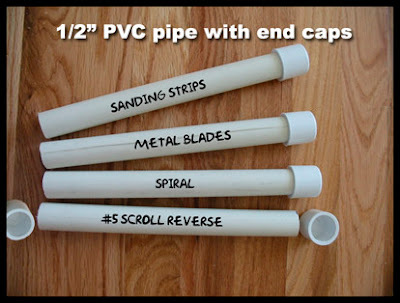 Pvc pipe can be found at most hardware stores. Use a permanent marker to label the tubes. The main draw back is not being able to see the blades with out opening the tube. Some scrollers build carousels to keep blades organized and easy to reach. Which ever storage method you use it makes scrolling more enjoyable if thing are organized and ready when you need them. I purchased this book by Patrick Spielman a few weeks ago. The book was published a few years ago but remains very relevant today. Some of the hardware is a little out of date but that does not detract from the book overall. I have to say it is the most informative scroll saw handbook I have ever picked up. The book covers everything from the history of scrolling to advanced sawing technique. The book is a hefty 350 pages long with very little fluff. There are informative chapters on every subject you can think of. I have several scroll saw books but this is the one I keep on my desk for quick reference. A nice feature of the book is the relatively low price for what you get. If you are new to scrolling you need this book. It will take you to the next level much more quickly than you will on your own. I would also recommend the book to the more serious scroller for general reference and inspiration. If you are interested in this handbook click the link above and you can purchase if through my eStore which is an Amazon affiliate. In the interest of fairness I do get a small fee for selling this book. That said I do think it is a fine product.